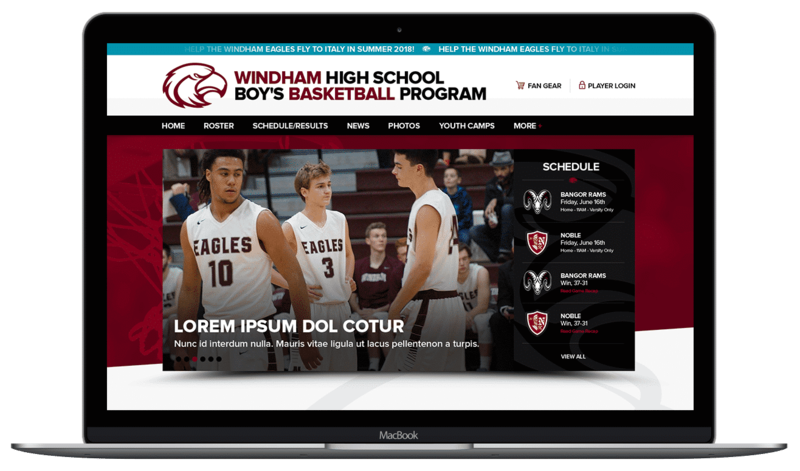 WordPress Website, Windham Basketball - NOYO Web Development Inc.
Our program couldn't be happier with the outcome of our new Windham Eagles website which helps us reach our fans and community with all of the excitement that goes with high school sports. We would like to give a very special thank you to Nicholas for sponsoring and supporting our team and helping raise the bar with high school sports online representation. The Windham High School Boy’s Basketball Program plays an important role in their school’s winter success which is the longest athletic season of the year. Through this long journey, they represent their community with class, dignity, and respect while being fierce competitors on game nights. Sportsmanship is a crucial component of their philosophy and goal for the players so it’s imperative to display appropriate behavior at games for all of their fans. WHS has been recognized many times over the past few years for positive sportsmanship and this is something they take great pride in and want to continue. Basketball in the State of Maine is very special and has a rich tradition that goes from Fort Kent to Kittery and Windham HS plays a part in that. Best of luck to all athletes, coaches, and fans for seasons that will be filled with great plays, lasting memories and a sense of class that will make all community members proud!